China is home to a large Muslim population. According to the State Administration for Religious Affairs (SARA), there are more than 21 million Muslims living in the country. A study done by the Pew Research Center, based on China’s census, concluded there are 21.6 million Muslims in China, accounting for 1.6 percent of the total population. According to the 2011 census, the largest ethnic groups of Muslims is Hui with 12 million and the second largest group is Uighurs with 10 million. In descending order Kazakhs, Kyrgyzs, Uzbeks, Tajiks and Tatars are the other Muslim groups in China. Additionally, Tibetan Muslims are officially classified along with the Tibetan people. One of the most important factors in the spreading of Islam in China is; Chinese travel to Islamic countries for education and the Hajj. During the Cultural Revolution, Chinese Muslims were not allowed to attend the Hajj, and only did so through Pakistan, but this policy was reversed in 1979. In recent years about 50,000 Chinese have traveled on the Hajj. Chinese Muslims now attend the Hajj in large numbers, typically in organized groups, with a record 10,700 Chinese Muslim pilgrims from all over the country making the Hajj in 2007. 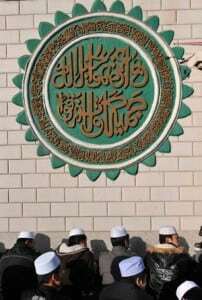 This contact with the center of the Islamic religion and seeing Islamic-ruled societies is bound to greatly affect Chinese people. When Chinese in the past travelled to the area and studied there, they came back with their view of the world changed. According to SARA, there are approximately 36,000 Islamic places of worship, more than 45,000 imams, and 10 Islamic schools in the country. Within the next two decades from 2011, Pew projects a slowing down of Muslim population growth in China, with Muslim women in China having a 1.7 fertility rate. Chinese family planning policy allows minorities including Muslims to have up to one child in rural areas. China’s policy on Uighur Muslims differs from the Chinese Muslim in the country. Uighur people have long suffered from human rights abuses, with 35 million people being killed since 1965 due to the Chinese army’s oppression or famine in East Turkestan, named by the Chinese as Xinjang, or the so-called “gained territories.” Therefore, the Uighur people prefer to use East Turkestan and reject the name Xinjang claiming China aims to destroy the historical heritage of the Muslim population by changing the names of cities, emphasizing the connection to other westerly Turkic groups. According to the Uighur Human Rights Project report, the number of arrests increased by 95 percent compared to the previous year, reaching 27,000. The number of those sentenced to execution and life imprisonment increased by 50 percent in the last six months. Wearing a headscarf in public, including on public transportation and when getting married in a religious ceremony, was banned in 2014, with fines of about TL 960 for wearing a headscarf in public. Radical behavior is banned. The Chinese define not drinking alcohol, non-smoking and avoiding eating non-halal food as radical behavior. Chinese officials continue to censor media in the region, with no freedom for reflection in the press. Chinese authorities ordered Muslim shopkeepers and restaurant owners in a village in Xinjiang to sell alcohol and cigarettes, and promote them in “eye-catching displays” in an attempt to undermine Islam’s hold on local residents. Establishments that failed to comply were threatened with closure and their owners with prosecution.